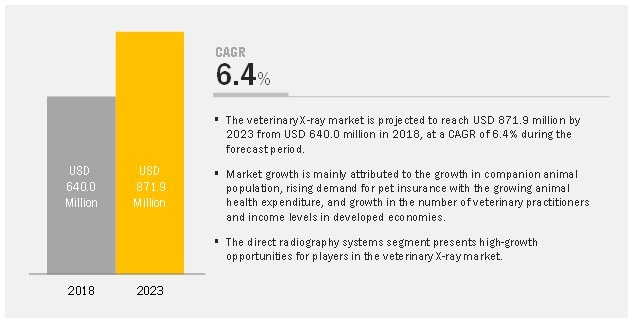 [192 Pages Report] The veterinary X-ray market is projected to reach USD 872 million by 2023 from USD 640 million in 2018, at a CAGR of 6.4%. The study involved four major activities to estimate the current market size for veterinary X-ray products. Exhaustive secondary research was done to collect information on the market, peer market, and parent market. The next step was to validate these findings, assumptions, and sizing with industry experts across the value chain through primary research. Both top-down and bottom-up approaches were employed to estimate the complete market size. 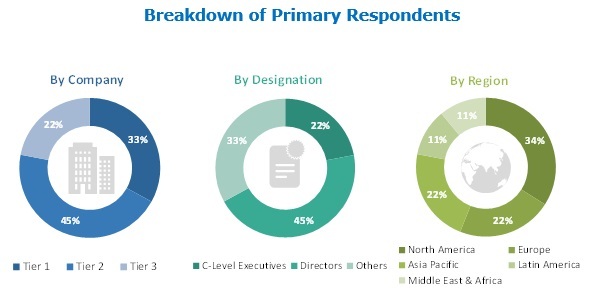 Thereafter market breakdown and data triangulation were used to estimate the market size of segments and subsegments. In the secondary research process, various secondary sources such as annual reports, press releases & investor presentations of companies, white papers, certified publications, articles by recognized authors, trade directories, and databases such as D&B Hoovers and Bloomberg Businessweek were referred to identify and collect information for this study. The veterinary X-ray market comprises several stakeholders such as veterinary X-ray system manufacturers and distributors. Primary sources from the supply side include CEOs, vice presidents, marketing and sales directors, business development managers, and innovation directors of veterinary X-ray systems manufacturing companies. Demand-side primary sources include industry experts such as directors of veterinary hospitals and clinics, veterinary hospital & clinic managers, diagnostic centers veterinarians, professors, research scientists, and related key opinion leaders. After arriving at the overall market size using the market size estimation processes as explained above the market was split into several segments and subsegments. In order to complete the overall market engineering process and arrive at the exact statistics of each market segment and subsegment, the data triangulation and market breakdown procedures were employed, wherever applicable. The data was triangulated by studying various factors and trends from both, the demand and supply sides. The veterinary X-ray market is projected to reach USD 872 million by 2023 from USD 640 million in 2018, at a CAGR of 6.4%. Rising animal health expenditure and growing demand for pet insurance, increasing number of veterinary practitioners in developed regions, and growth in the companion animals market are the primary drivers for the veterinary X-ray market during the forecast period. The report analyzes the veterinary X-ray market by technology, type, animal type, application, mobility, end user, and region. On the basis of technology, the computed radiography systems segment accounted for the largest market share in 2017. The rising need for increased flexibility, increasing demand for affordable digital X-ray equipment, and the benefits offered by CR systems over traditional X-ray systems are some of the major factors driving market growth. Based on type, the veterinary X-ray market is categorized into digital X-rays and analog X-rays. The digital X-rays segment accounted for the largest market share in 2017. The large share of this segment can be attributed to the number of benefits offered by digital X-ray systems over analog systems, including cost savings, improved efficiency and productivity, and patient-centric, value-based imaging. The veterinary X-ray market, by end user, is segmented into veterinary hospitals & academic institutes and veterinary clinics. The veterinary hospitals & academic institutes segment accounted for the largest market share in 2017. The large share of this segment can be attributed to the widespread adoption of X-ray equipment in large universities for educational & research purposes and the growing demand for modern, state-of-the-art large veterinary facilities. Geographically, the veterinary X-ray market is segmented into North America, Europe, Asia Pacific, Latin America, and the Middle East & Africa. North America accounted for the largest share of this market in 2017. Rising number of veterinary practices, increasing number of companion animals, and rising companion animal healthcare expenditure are some of the key factors driving the growth of the veterinary X-ray market in North America. The prominent players in the veterinary X-ray market are IDEXX (US), Fujifilm (Japan), Onex Corporation (Canada), Sedecal (Spain), Agfa-Gevaert (Belgium), Sound Technologies (US), Fujifilm Holdings Corporation (Japan), Canon, Inc. (Japan), Examion (Germany), Konica Minolta (US), DRE Veterinary (US), and Heska Corporation (US). In 2018, Heska Corporation (US) formed a partnership with Pathway Vet Alliance (US). Under the terms of this agreement, Pathway plans to align its internal diagnostic portfolio with Heska, which can provide in-house operational services like point-of-care blood diagnostics, digital imaging, and allergy testing. In 2018, Carestream Health signed a service partnership agreement with Med Imaging Healthcare, a diagnostic imaging equipment maintenance company. The partnership was aimed at providing wider maintenance coverage and support for Carestream customers across Scotland. In 2016, Heska acquired Cuattro Veterinary (US), a company offering flat-panel digital radiography systems. This international expansion provides Heska with a strong and established platform for launching Heska's blood diagnostics platforms and programs to international markets. Who are the top 10 players operating in the veterinary X-ray market? What are the driving factors, restraints, opportunities, and challenges in the veterinary X-ray market? What are the industry trends and current scenario of the veterinary X-ray market? What are the growth trends in the veterinary X-ray market at segmental and overall market levels?